"I smile because I am happy." amazing youth and teens at UrbanPromise Trenton. Meet Winifred, our February Face of Promise! Winifred is a dedicated 7th grade student who has been a student in our AfterSchool and SummerCamp programs since UrbanPromise Trenton began in 2011. 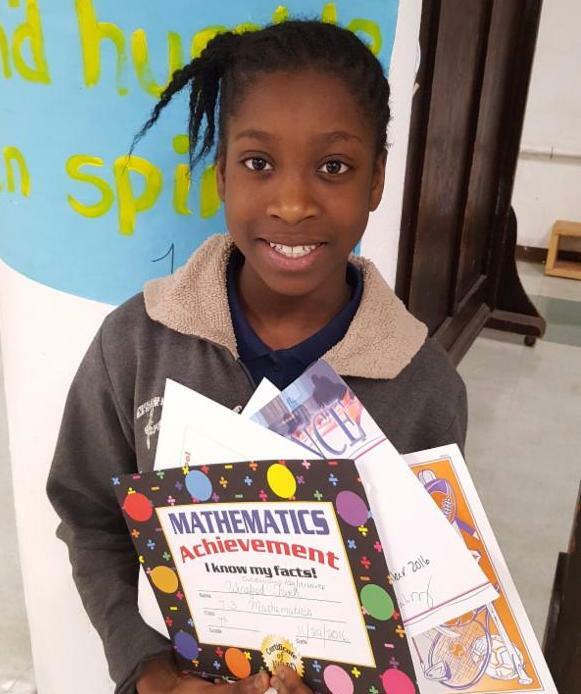 Winifred is a special young lady; she recently received five achievement awards from Joyce Kilmer Elementary School: Perfect Attendance, Great Performance in Language Arts, Great Performance in Social Studies, Mathematics Achievement and Athletic Award for Girls Soccer. We sat down with Winnie to find out what she thinks about school, UPT and why she is always smiling. UPT: How do you feel about school? Winifred: I like to learn and participate in class. I really like to learn new things. UPT: What is your favorite subject and why? Winifred: Math is my favorite because it is challenging and, if I pay attention, I can understand it. I like to figure out the problems they give me. UPT: You have been at Camp Truth for a long time, what's it been like for you? WInifred: There is so much I like! First, people really care about you here. They want you to do good. And they help you with your homework, plus we have fun. I have gone on a lot of great trips with UPT and met a lot of great people. I also like that they teach you about God because I love hearing the word of God. UPT: Do you think you would like to go to college? Winifred: Of course! I want to study math and art. UPT: When we see you, you are always smiling- why do you smile so much? Winifred: Because I love smiling and it shows that you are happy and how beautiful you are and smiling allows me to be myself. We all admire how hard Winifred works, but most of all, we love that smile! Does your company offer a donor match program? Click on this link to find out how to process your donation. Your gift will go twice as far!